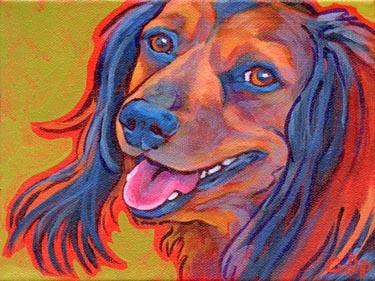 Colorful dog portraits for purchase! These original paintings are on 1.5 inch deep canvas and wrap around the edges. A modern look with no need to frame, can also stand alone on a shelf. Painted in acrylics on canvas, ready to hang, signed and varnished with UV protective polymer varnish. To purchase, send me an email with item name and number.